Mantic Games is a fairly new addition to the industry. 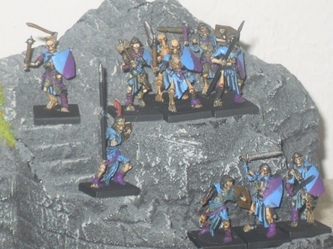 What they specialize in, and what has put them on the map in a big way, is that they create armies which are totally suitable, and ideal replacements for Games Workshop models in Warhammer Fantasy Battles. That's just the most brutally honest way to put it. Granted they did mention something about making a game of their own from the models they offer one of these days, but it's crystal clear who these models are designed to attract, and that's a GW WFB enthusiast first and foremost. 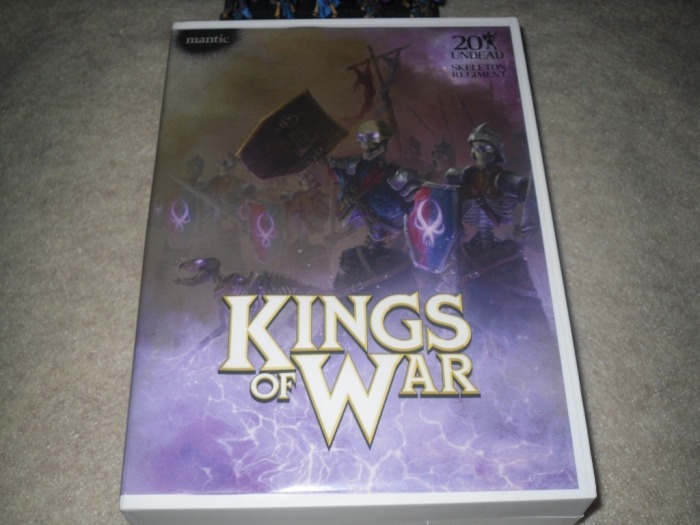 With Warhammer Fantasy Battles 8th Edition right around the corner to boot, Mantic Games is totally in a position to be one of the most profitable companies in our industry in 2010. All the way up until the GW price increase, Mantic also had many sales, making their already amazingly affordable armies, even more amazingly affordable. Kings of War is the official name for their model range, and their motto is “Building Big Armies”. At present they offer two armies, which are the Elves and the Undead, and the third is close to being done based on Dwarves. I was eager to see what they had going on first-hand, because I had heard, and saw so much about Mantic Games recently. 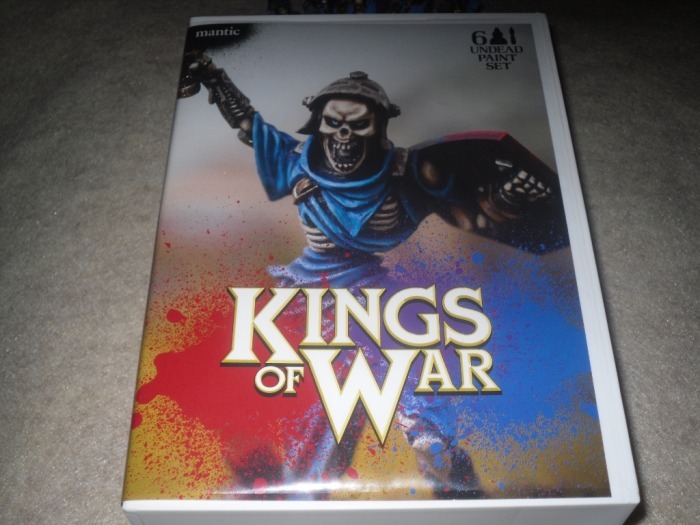 So today we will be looking at the Kings of War Undead Paint set, the Undead Skeleton Regiment box, and Undead Ghoul Troops box. The first thing you notice right away is that all Mantic Games' products come in a plastic case, which are very reminiscent of the old VHS video tape cases, only I've seen three different sizes in terms of thickness from them so far. 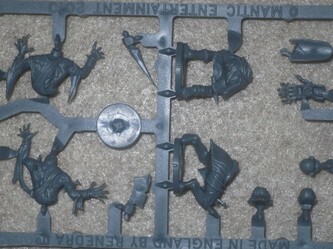 The Undead Ghoul Troops box is the thinnest. The next size up which is about 1/4th thicker is the Undead Skeleton Regiment, and lastly the Undead Paint set is hair away from being twice as thick as the Ghoul box, and about another 1/4th thicker than the Skeleton Regiment box. Otherwise, they are all 7.5-inches tall and 5.5-inches wide. It's only the depth that changes, depending on what product you end up with. These boxes serve two purposes. The 1st is to make sure their products end up in your hands in one piece, and the 2nd is to be a carrying and storage solution for the figures. 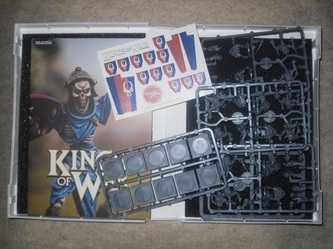 Every package includes a few sheets of black foam, and once the figures are painted up and ready to play, you line the boxes with the foam sheets and set your figures inside. Mantic even makes what they call a Messenger Bag, which is made specifically to hold multiples of these little white cases. The Undead Paint Set includes a 10 piece Skeleton warrior sprue, 6 acrylic Warpaints, a paint brush, a stickers & banner sheet, a little fold out mini poster of the Undead with some fluff on it, a 10 square 20mm base sprue and lastly two thin sheets of black foam. Lets talk about the figures first. I'm very impressed with just how much stuff they pack into a single sprue. The sprue contains 10 multi-part skeleton warriors. These are mostly separated into upper torso, and lower torso with legs attached pieces. Six of the pieces come this way, complete with arms already attached, some with weapons already in-hand. I believe two of the six are empty-handed, giving you the option to select from a spear/polearm, or sword for their weapons. The other four figures, are separated into torso and lower torso/legs pieces, but two of the four you can elect to use different right arm/weapon combos, and out of the these four you can also select which heads to utilize as well. The first six I mentioned, also have a peg on the upper body, and a socket on the lower body where they attach to each other, so they essentially snap together and stay together nicely via this design. A single dab of glue and you're all set. The later four with more options come together at the same joint, just minus the peg/socket combo. 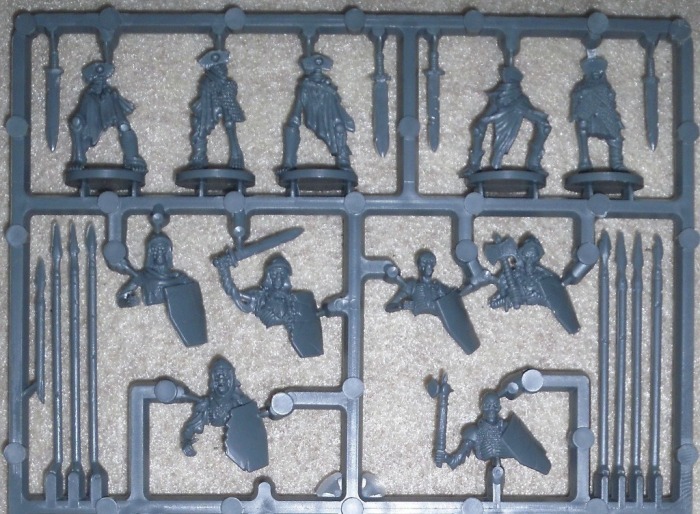 There's also a bunch of nifty little options on the sprue, so you do have customizing options. There's even a neat what looks like a small skeleton dog pet, a scenic ground piece, with a skeleton coming out of the ground which you could opt to use, a gravestone, and another simple pile of bones with a skull on top, in addition to swords of various sizes and styles, and a variety of spear/polearms to choose from as well. Although there aren't enough spears, or enough swords to arm the entire group with all spears, or all swords. Granted I can't say these are as customizable as Games Workshops' models, because you are stuck with the arm angles and poses that they molded into these models, with the exception of the two per sprue you could pose the right arm as you see fit, but the left is still holding a shield as molded. Personally, I don't see this being a big deal, as I'm not that picky about being able to pick how each and every arm is angled. I'm of the mindset of if there's at least 4-6 different models out of 10, that's enough variation to keep me happy. More than that is overkill. Quite frankly, this design Mantic uses, makes assembly A LOT faster, and a lot easier overall. There's no sitting here forever waiting for one arm to dry, before gluing the other one on, and then if you attempt too soon to move onto the next one, you end up knocking the last one off. There's none of that nonsense to deal with putting these models together. I personally think that the outstanding sculpting of these models, makes up for the lack of being able to pose each and every arm, the way I want to. There really is so much detail in these figures too, and variety. Some have chainmail bits, some have rags, one might have a mace, the other a sword, one I really thought was fun had an axe planted into his skull. They really did an amazing job detail-wise on these figures. By far, they're probably some of the very best plastic skeleton figures that you can buy today. These are all plastic models, and in terms of assembly and clean up, I couldn't have ended up with better models. I mean that too. 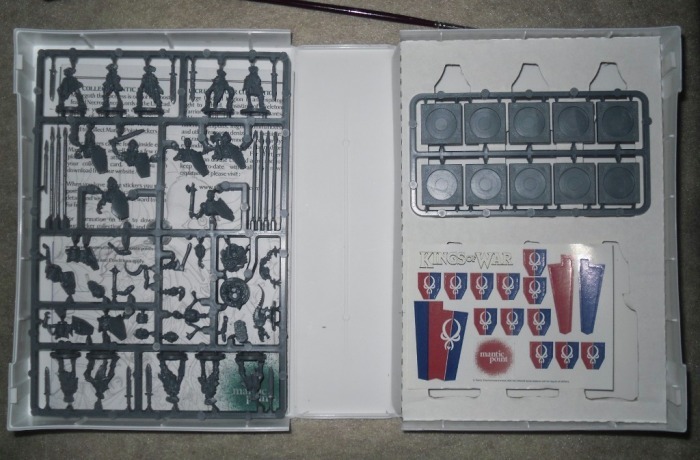 I couldn't find but the faintest of mold lines, and that was only on a single piece or two, out of all the pieces on the sprue. That is outstanding. I took my time preparing and assembling, and I'm really meticulous when it comes this. I was even watching TV as I put this box together, so I was slightly distracted, and it still only took about 30 minutes from start to finish to clip, cut and file the left over bits from clipping, and then glue them all together. 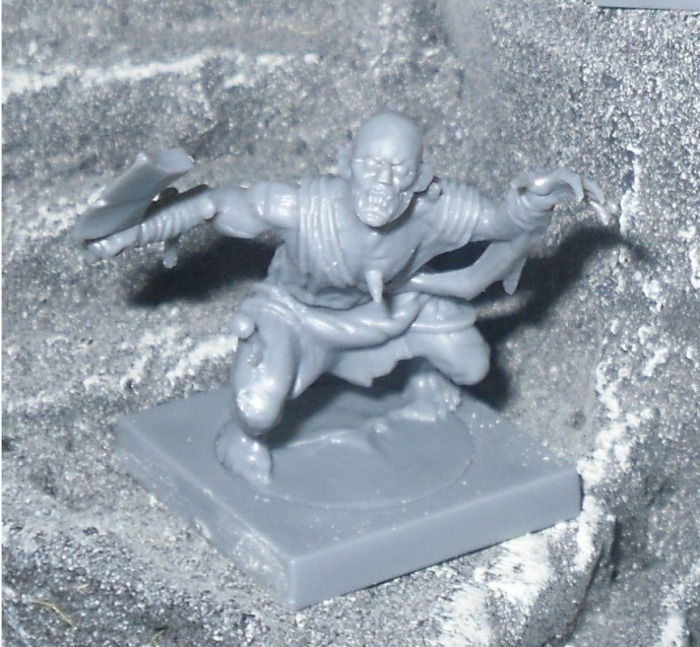 One feature exclusive to Mantic figures is that each piece comes molded to a tiny round base at the feet. These aren't anything special, as they don't stand well with them, and they're not eye candy, even tho some look to have some very minor detail at the feet. What makes them unique, is that the round base is a peg, which fits into the round holes in their square 20mm bases. Almost every one was a perfect fit too. I for one get tired of having to fill the gaps from slotted-bases, so this was a really welcome change from the norm for me. The round peg and round hole basing design it brilliant. In comparison, these models look about a hair smaller overall than the Games Workshop counterparts. The GW models seam to be made up of thicker bones, and are a more unrealistic bone scale because of this. The Mantic models have a more realistic bone scale. 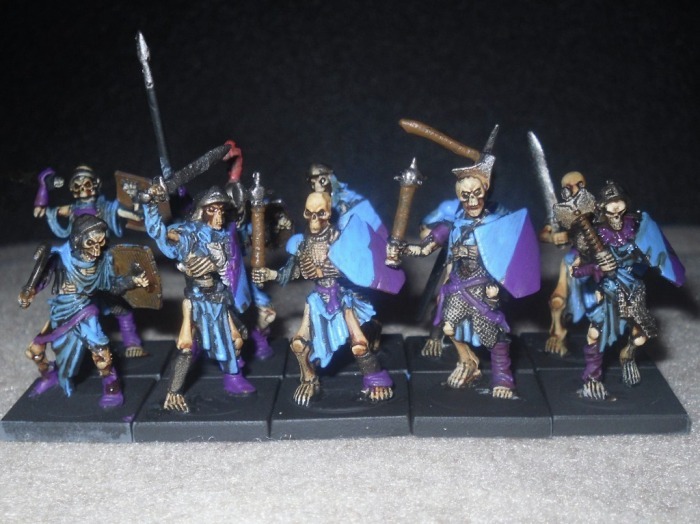 In appearance the GW Skeletons are almost cartoony and laughable. The Mantic models are totally reminiscent of those found in the classic Seventh Voyage of Sinbad & Jason of the Argonauts feature films of the late 50s and 60s, giving them a Ray Harryhausen look and feel. Let's talk about the rest of the box now. 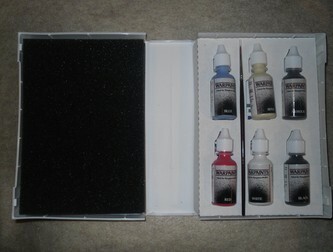 The paints come in little 15ml (1/2oz) dropper bottles, just like Vallejo and Reaper Pro paints. The paints are made by Army Painter, and are from their all new Warpaints series. Six bottles are included, and they are Bone, Black, Red, White, Blue and Armour colors by name. I'm also going out on a limb here to assume that the brush is also an Army Painter brush as it's the same color as some of their brushes I've seen at the hobby shops in the past, but there's no name imprinted on it anywhere. It appears to be a #1 or maybe even a #0, but it's hard to tell, those sizes are so close to each other. I can't say it's the best brush ever, either. I used the brush provided, plus the paints included to whip up an average, and fairly quick paint job on the models in this box. I wasn't aiming to win any awards, and I didn't even get to clean up some of the errors, but I just wanted to throw some color on them to give you an idea of how nice they really are, and to review the paints. This is definitely not my best work, but they look pretty damn good with less than a one hour paint job on them from start to finish. These are definitely painter friendly models. With some clean up, and some more detailing, plus sealing they'll be some really impressive models. As you can see tho, even as somewhat of a work-in-progress they do look very nice, proving that it doesn't take much of an effort to make these look presentable on the table. During the process the brush began to fray a little from time to time, it did however manage to hold a point decently. My guess is that it's a higher-end synthetic, or a low-end sable brush. It's okay for a starter brush, but it definitely won't last for the long haul. As for the paints, they actually didn't seam bad. At a glance I'd say they're almost as good as Vallejo and Reaper, but the Armour color included didn't seam as pigment heavy, and was a lot thinner than what I'm used to utilizing from Vallejo or GW paints. However, the blue and bone shades seamed to offer nice coverage, and both had about the same consistency as Vallejo and Reaper Pro Paints. This is definitely a miniatures-quality paint, but I can't fully pass judgment on the line as a whole yet, before seeing more metallics from them, and some other shades. I'll be taking a more in-depth look at the Warpaints line from Army Painter as soon as the line launches later this month here in North America. For a starter set tho, it's a very nice paint set, with a reasonable variety of colors to get the job done, complete with 10 excellent Skeleton warriors to help round out an Undead army. Actually to test the paints I used the Warpaints exclusively, with the exception of adding Coat d'arms purple, a Formula P3 shade of brown, and a Gryphonne Sepia GW wash when I painted the skeletons for this review. I just thought that purple would help them pop more, and I was right. I think a brown would have been a better option than White in this set too, because I didn't need to highlight bone to white at all, and they still look quite nice. I think a shade of brown would have been more useful for weapon handles, even for some of the clothing and rag bits, more than white. Otherwise the Undead Paint Set assortment worked, but my own artistic style cried out that I just had to use a few more shades that weren't in the set, to get the job done. Others mileage will definitely vary. The MSRP and price direct from Mantic Games for the Undead Paint Set is 14.95 GBP, which converted equals $21.62 USD. This is a rather new set, as I haven't seen these available in North America just yet. So my guess is that it should hit North American retailers any day now, and all other 14.95 GBP sets they offer, usually end up $20 USD here in the states. At that price, this is a really nice way to start off with Mantic products. This set is also the only way at present to get your hands on the new Army Painter Warpaints line of acrylic paints, as they plan later this month to officially launch the Warpaints line themselves. As recent as last week Mantic Games released what they call just the Mantic Paint Set too, which includes 9 Warpaints colors, which is 3 more bottles than what's found in this set, plus 2 Elves, 2 Ghouls and 2 Skeletons at a cost of 17.95 GBP, which is roughly $26 USD. This will be easy to review since we just looked at the Undead Paint Set, because the Skeleton Regiment box comes with 2 sprues worth of Skeletons (20 Skeleton warriors total), and one of the sprues is identical to the one from the Undead Paint set. 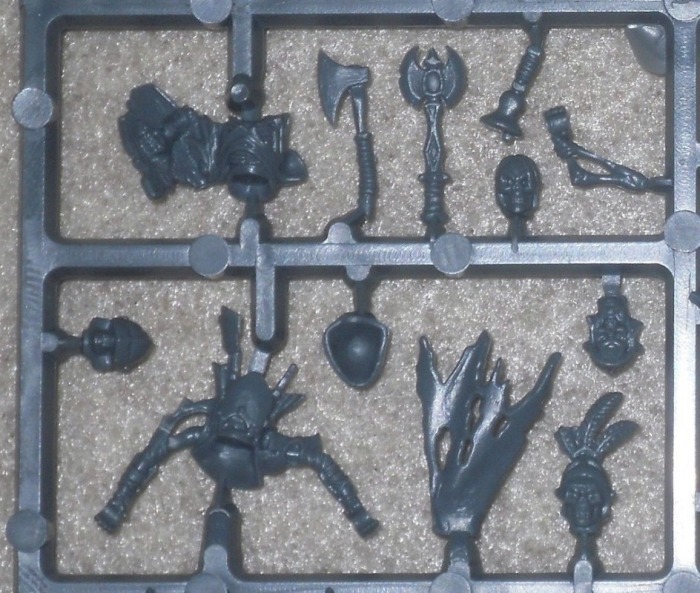 Therefore for most of what you can expect from this box, to keep me from being terribly redundant, just read everything I said about the Skeletons from the Undead Paint set, and you know exactly what to expect from the majority of this box. 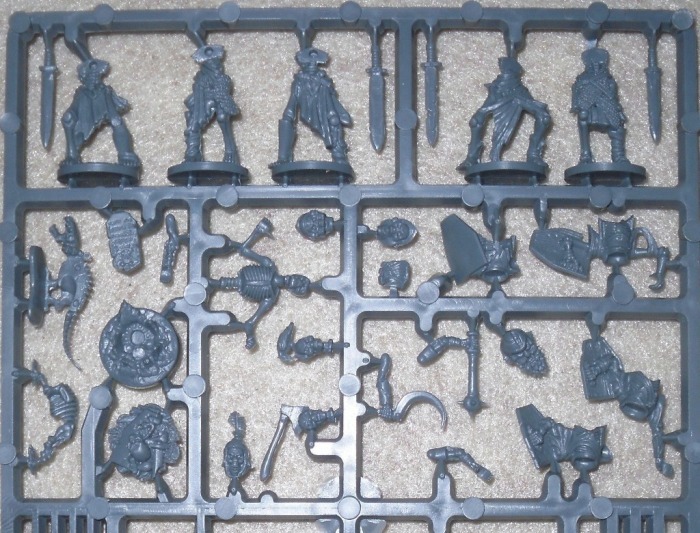 The 2nd sprue in this box set is almost identical to the first, but the middle of the 2nd sprue comes with some slightly different options to build a command group from. 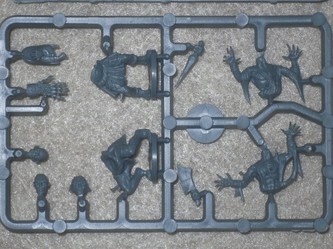 This part of the sprue replaces the pieces in the same spot from the first sprue. 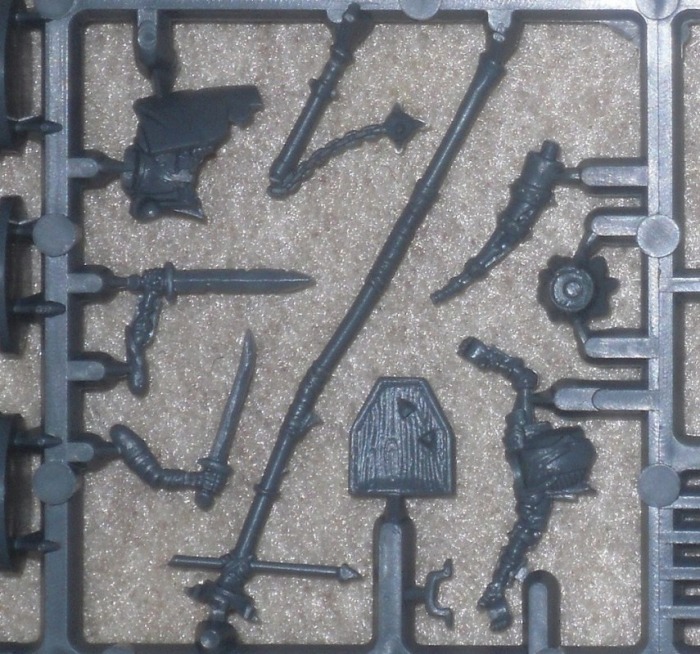 Details like a tattered cape, standard bearer flag pole, a couple of different separate axes, different torso and head options are what makes the 2nd sprue different. 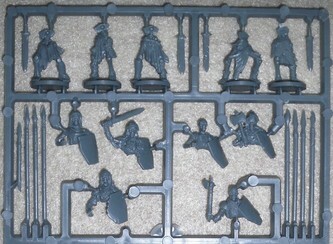 Otherwise the rest of the pieces on it are identical to those found on the first sprue. This box retails for $20 USD, which works out to about $1 USD per figure. That's right, it's not a typo. Just $1 USD per figure! This is what makes Mantic such a great option, not only do you get excellent quality plastic figures, but at a price that most can afford. 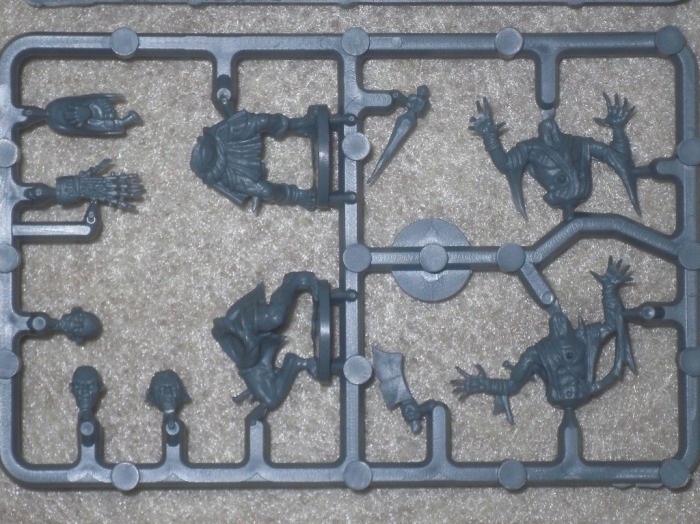 By now what I've gathered is that Regiment boxes are 20 model sets, and Troop boxes are 10 model sets, and being this is the Ghoul Troop box, this is a 10 model set of their Ghouls. I'm not surprised to find that the sculpts are really nice. I'd have to say that these look more vampire-like than anything else. They're slumped over, poised to launch at their prey, in a slowly lurching forward pose. 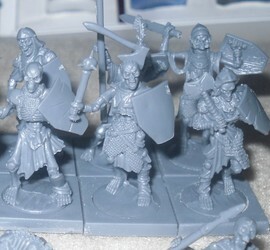 These are so far my favorite sculpts from the Undead range. They're really dynamic, and the detail level is impressive. There appear to be spikes or nails punched through their skin in some places, so they really look to thrive on pain. They definitely look like they mean business, which is what counts the most. 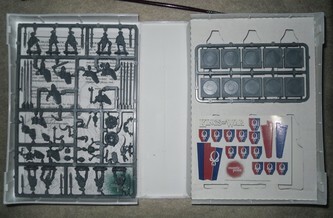 This is a little disappointing since the Skeleton sprues were larger full size sprues, with far more variation options. 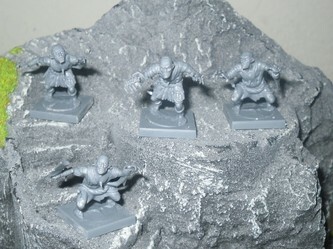 It's just sad that they didn't offer at least 4-6 completely unique sculpts for the Ghouls. As nice as these are, I can only imagine how much better a set this could have been, if there was at least a few more variation sculpts. 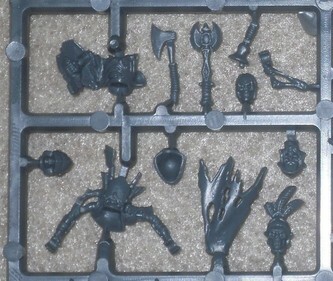 Sure we can use the 3rd head to make another figure from, and I can swap the upper torso around onto the other lower torso, but in the end you end up with just 4 somewhat different models with what's included, along side a a few duplicate models with simply a different weapon in their right hand. Even with the limited variation options in this set, it will only set you back $12 USD. That's just $1.20 per figure, and at that price per figure, I think most can deal with the lack of more variety in the sculpts. I know at that price I could. I would bet that the reason these are so affordable, is because they didn't need very many molds to make the set from. Therefore, the lack of variety within the set, is probably the very reason these are so affordable. Clean up and assembly wasn't too bad either, although I did find more mold lines on these, than I did on the skeleton models. Nothing beyond the norm. Since the arms are already in place, all you need to do is glue the upper to the lower torso, and then glue the head on and your done. If you want to use the other hands, simply cut off the right hand, and glue the new optional one on. It's that simple. 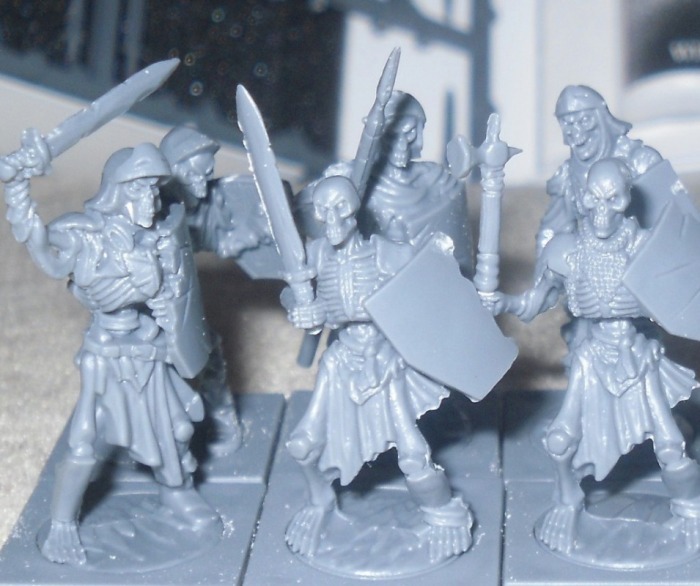 These also come with 20mm square bases, utilizing the peg and hole design I mentioned that the Skeleton figures have. In addition to being fill-ins for a Vampire Counts WFB army, these sculpts are so nice, that I should also add that these would be totally suitable for most any Gothic/horror miniatures game as well. They could easily pass for vampires, blood thirsty vampire followers, maybe even demonic zombies, they certainly look very menacing. They definitely have versatility potential. 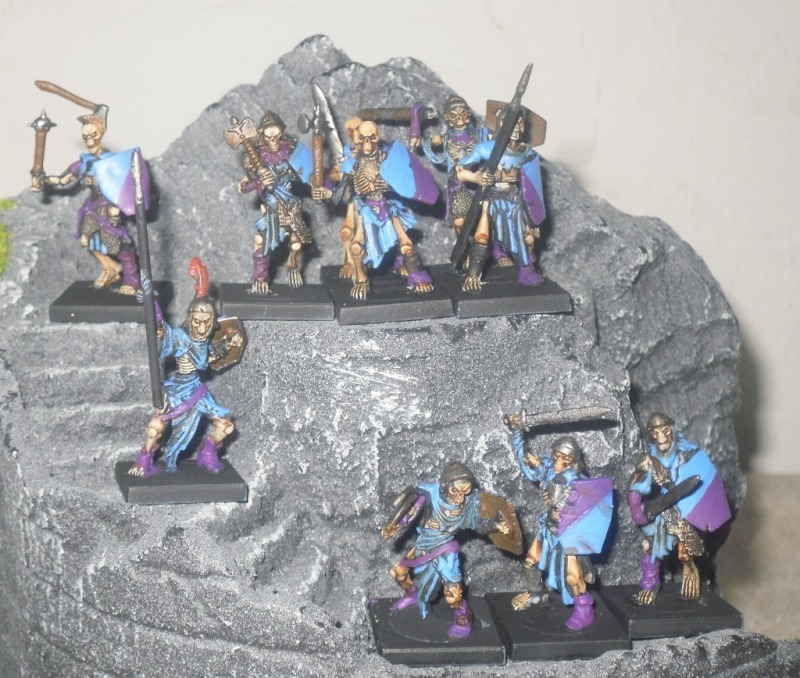 I'm really impressed with Mantic Games Undead range so far. Almost all of their plastic models are priced the similarly too. The smaller boxes cost a hair more per figure at about $1.20 USD per figure, while the 20-model boxes end up in the $1 USD per figure range. It can end up better than that even. They do offer larger Warhost, Detachment and full Army deals via their website, which usually yields more of a break on the price, plus free shipping since orders over $50 USD qualify for free shipping. 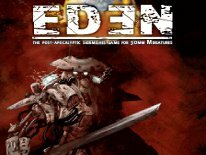 With as often as I've seen them offer convention deals, and various % off sales, it's not unheard of to get a really amazing deal on Mantic Games stuff by simply keeping an eye on their website. Just over Memorial Day Weekend they offered what they called a Bank Holiday Madness sale, which was 15% off, and by spending over a set amount (so much for UK, Euro and Rest of the World) the free shipping deal still stands in conjunction with any of their sales. 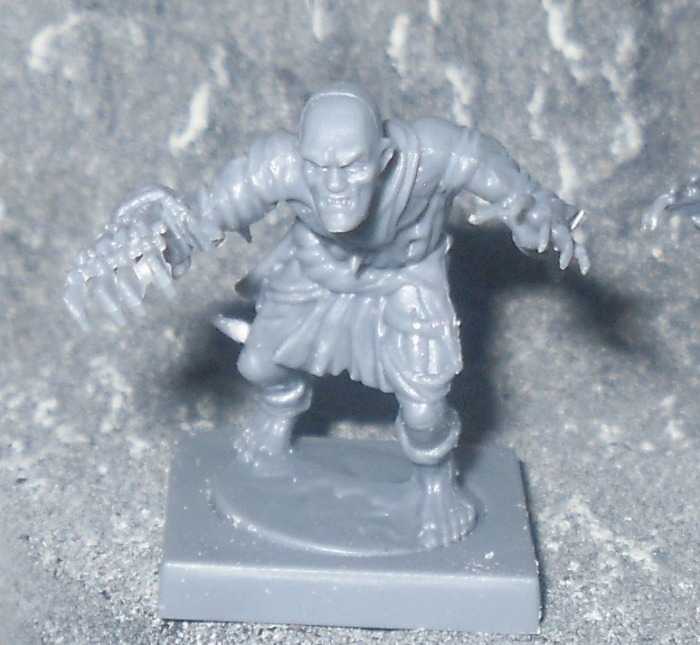 I can only comment on what I've seen of their Undead range so far, and based on what I've seen it's clear that Mantic Games won't go head-2-head with Games Workshop's Vampire Counts line in terms of variations and customizability. The Mantic models are also slightly smaller than the GW counterparts, but more realistically proportioned. So at a glance I'd think you could get away with integrating them into an army with existing GW models in it, but it would probably look best overall building a completely Mantic exclusive army. There's definitely two different, yet very similar artistic styles going on between the two companies. Despite this, Mantic models do have the benefit of a lot easier cleanup and assembly, and some limited customizable options. I think the sculpts are equally as good as what GW has to offer, some of which are better even like the Skeletons. Most importantly when it comes to price, no one out there can touch Mantic Games, because dollar for dollar you get almost twice as many models versus GW models per box. If you're looking to build a Vampire Counts WFB army, the Undead range Skeletons and Ghouls from Mantic Games is the best alternate option out there today. The Ghouls also have the potential of being utilized in other Gothic/horror game systems, because they look so frightening. Their paint sets are also a nice way to get your hands on the new Army Painter acrylic Warpaints line, plus some nice Mantic figures in a single box. They're reasonably priced too, more so considering almost any miniature specific paint out there these days is in the $3 per 1/2 oz bottle range, give or take some change. So 6x bottles times $3 USD equals $18 USD. Add to that, even a cheap miniature painting designed brush runs $3-$5, and the cost of the Undead Paint set is just $21 USD. It's like buying the paints and brush, and getting the figures for free essentially. The boxes are also a nice touch, but I can't say they would be my #1 choice for protecting and transporting my miniatures. I think of them more as a bonus, but most won't take them seriously for being carrying cases for metal figures. It's a novel idea, and I give them credit for making the effort. Still, the boxes are definitely a better way to ensure the products get into our hands in one piece, versus the standard cardboard boxes that the competition uses. 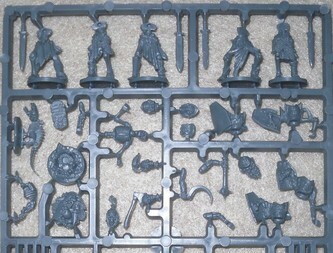 I guess for the plastic pieces, they aren't a bad option to carry figures around in, but they won't replace a more dedicated miniatures case transport system like Army Transports anytime soon. 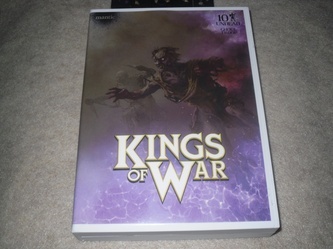 With 8th Edition of Warhammer Fantasty Battles right around the corner, this is one company to keep an eye on throughout the rest of 2010. The previews of the drawf army pieces they've been working on are looking good too, and they should be ready before too long now. 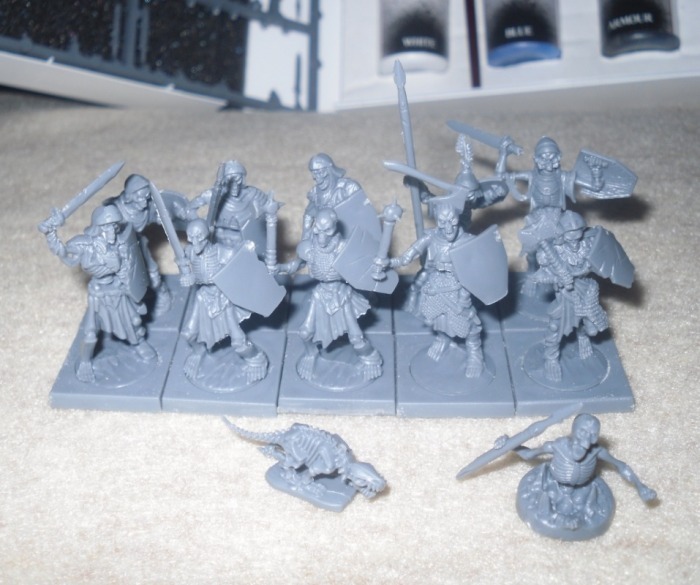 We should be taking a look at more Undead, some Elves and the Dwarves from Mantic Games in the coming weeks too. So keep an eye on WarGameGuru for more on what Mantic Games has to offer.